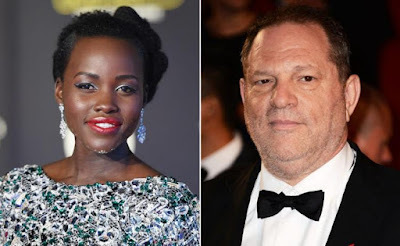 Lupita Nyong'o has joined the long list of women who have accused disgraced mogul movie producer, Harvey Weinstein of trying to undress in front of her in a bedroom. Nyong'o says she met Weinstein in 2011 at an awards ceremony in Berlin while she was still a student at the Yale School of Drama. Lupita claims several months later, she was invited by Weinstein to join him at his family home in Connecticut for a screening of a film. Nyong'o says she arrived at Weinstein's home, met his wife and children and Harvey set her up to watch the film in his private screening room. According to Lupita, Weinstein interrupted the film just 15 minutes in and invited her to his private bedroom. Once in the bedroom, Lupita says Harvey asked if he could give her a massage. The actress says she panicked and offered to give the producer one instead, he obliged, removed his shirt and laid down on the bed. Nyong'o claims she fled the producer's home when he tried to remove his pants. The actress says she turned down another advance by Weinstein not long after the massage incident and he threatened her career. It was after she won an Oscar in 2014 that Weinstein approached her once again, begging her to star in one of his films ... an offer she declined.